Most of the cranes dotting the skyline now are building apartment high-rises, though there are also several new offices going up at a time of intense competition for space among companies. Seattle still has more construction cranes than any other U.S. city, as developers keep building high-rises in the fast-changing city. The city of Seattle has 59 cranes sprouting out across the skyline, down slightly from the 65 counted six months ago. But that’s still 15 more than Los Angeles, the next-highest city. Outside of a lull a year and a half ago, Seattle’s crane count has hovered around 60 since 2016, when it took over the national lead in cranes. The new numbers come from Rider Levett Bucknall, which counts cranes in big cities across the world twice a year. As has been the case for years, most of the cranes are helping build apartment high-rises, although some of those housing projects recently have begun switching to condos. Fifteen of the cranes are at residential-only projects, and 25 are at mixed-use developments – typically housing plus some other element, like an office or hotel. Another eight cranes are working on commercial projects like offices, and three are at hotels. There are also a couple of transportation projects, one school development, a hospital and an industrial project. Most of the cranes are in the core of Seattle, especially in South Lake Union, but it’s easy to spot them across the city, from Ballard to West Seattle to Sodo. There’s nothing to suggest the construction craze is about to die down. Although apartment rents have flat-lined over the past year, developers continue to build housing at the same pace as before, and the pipeline for possible future projects hasn’t changed. The office market, meanwhile, continues to tighten, with vacancy rates dropping and rents rising, bolstering demand for new work space that companies are quickly gobbling up. The Broderick Group said in a report Monday that it expects 4.4 million square feet of office space to open in Seattle over the next three years – the equivalent of six or seven skyscrapers – and about two-thirds of the space is already spoken for. After Los Angeles, the cities of Portland, San Francisco, New York and Chicago all have between 26 to 30 cranes each. 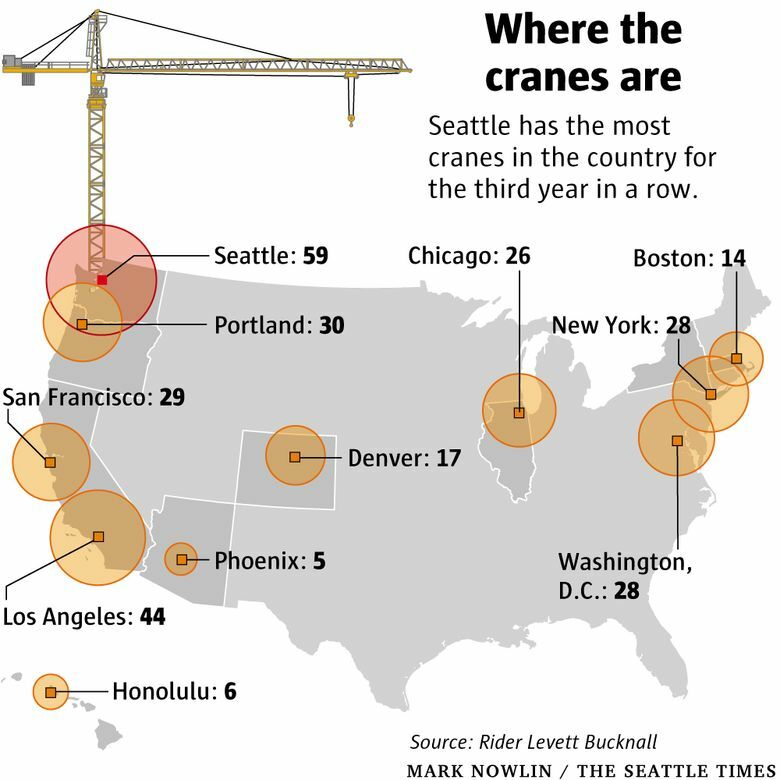 Denver and Boston have less than half the number of cranes as Seattle. 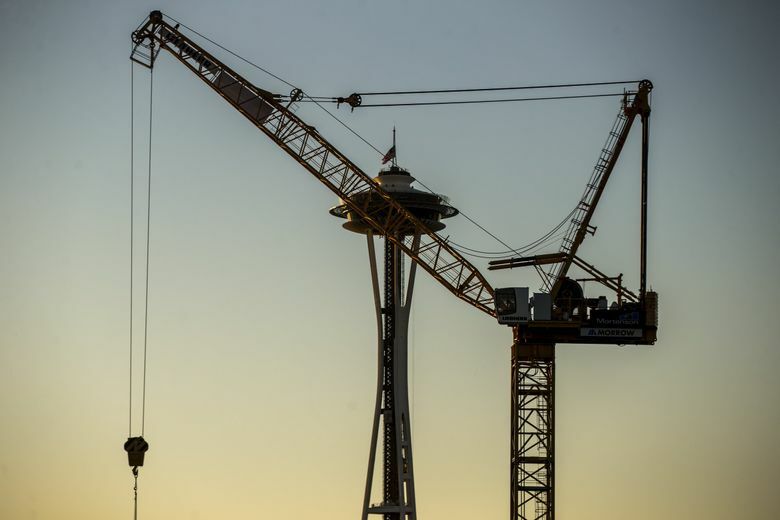 City officials in Bellevue — which is not counted in the Seattle data — said they had 14 cranes as recently as July, though a more recent count wasn’t immediately available Tuesday. Update: Bellevue officials said Wednesday the city was now up to 15 cranes, and noted that Redmond and Kirkland also have a few in the air. Toronto continues to lead North America in cranes, with 104, and several other international cities from Australia to the Middle East have well over 100 cranes.